On rare occasions, I’ll see a cyclist in Berkeley try this: riding a bike while holding an umbrella. I saw dozens of people doing so with seeming ease today. This guy was negotiating his way past a tour group on a sidewalk outside the Imperial Palace. 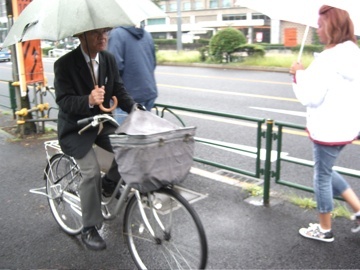 Elsewhere, I saw a woman whose bike appeared to be fitted with an umbrella holder–a unit that also incorporated a headlight.